What Are the Benefits of a Furnace? | Comfort First Heating and Cooling, Inc. Furnaces are a very efficient heating system for your home. Furnace efficiency is denoted by an AFUE rating. AFUE stands for “Annual Fuel Utilization Efficiency” and the higher the AFUE percentage the more heat the furnace delivers to the relative amount of fuel consumed. A standard, natural gas burning furnace typically has an AFUE rating of 78-84% though they can go even higher. 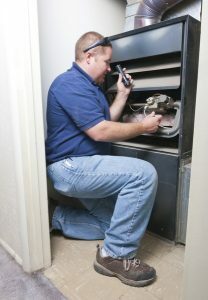 If you’re trying to find a good furnace for your home, then contact one of our professionals. We work with all the best brands here at Comfort First Heating and Cooling, Inc. so we can match you with the right make and model for your needs. A furnace is a great system because they heat your home so quickly. They have faster start times and quickly provide comfort to the entirety of your home within a matter of minutes. Join our plan today to get the full benefit of your furnace system. The great thing about a furnace is that you can improve your indoor air quality through this system. Since this is a forced air system that uses your ductwork, you can install an air purifier, dehumidifier, humidifier, or an air filtration system right into your furnace system. This is a great option because you can condition all the air in your home at once rather than using small, spot conditioning systems like portable room humidifiers. Improving your indoor air quality shouldn’t be an afterthought. Your indoor air quality affects your personal health and your home’s comfort. Why Choose Comfort First Heating and Cooling? So you’ve decided that you want a furnace in your home, why choose Comfort First Heating and Cooling to perform the services for this system? Well, we’re a family-owned and operated business here in Joliet with more than 25 years of experience in the HVAC industry. We choose all the technicians we employ wisely because we only want the most experienced, well-trained technicians for your home services. If you want great furnace services in Joliet, contact Comfort First Heating and Cooling today to schedule an appointment.